Like most American children of my generation I was taught in school to regard the Roosevelt name as mythic-heroic. Franklin Delano Roosevelt was largely regarded as the George Washington of my birth century, and his wife Eleanor a model of quiet, intelligent feminism minus the misandry that later tarnished the cause. Of Theodore Roosevelt I can recall only admiration for a man described as a fearless, rough-and-tumble outdoorsman made by an anarchist's bullet into the youngest President in history. "Teddy" Roosevelt advised speaking softly while carrying a big stick. Darrin Lunde's portrait of Theodore Roosevelt in The Naturalist is that of the same man, but with very different insight into the making of America's first great naturalist President. For example, they never taught us that asthma crippled Theodore as a child. I found it rather heart-breaking that his father's desire for a strapping, healthy son drove Teddy to attempt to overcome his weakness by developing his physical condition. Nor had I any idea that our 26th President was from childhood an ardent bird lover, or a devoted, prolific writer who among other things published 45 books, mostly about animals. Almost everything I learned about Theodore Roosevelt in this book was news to me, which by itself makes it a must-read for anyone who wants to know the subject better. The pickle for the modern reader is dealing with the dichotomy of Roosevelt's naturalist/conservationist views with his love of hunting, particularly big-game hunting. I think the author makes a great case for accepting that a statesman can want to protect nature at the same time he's heading out and killing animals -- often rare, borderline extinct animals at that -- every chance he has. This alternative portrait of Roosevelt is very detailed and unflinching, and although it's presented with obvious fondness for the subject it does inform, in some ways with brutal exactness. 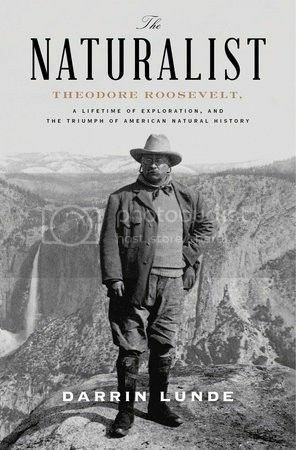 The author provides a very readable narrative of Roosevelt's life as a naturalist, and offers a wealth of information about the many people who influenced his attitudes along the way. At times I felt as if I walked beside Roosevelt as he traveled the American West and the African plains, hunting and shooting (often badly.) I couldn't rejoice in the amount of animals Teddy killed -- almost 11,500 in Africa during one expedition -- and I kept wishing he'd taken cameras instead of guns with him. Yet while we may find his passion for naturalism via hunting reprehensible and offensive today, he was a product of his time. This founded the practices that built all those really cool animal exhibits you see in natural history museums all around the country; men like Roosevelt, who went out and shot the very first specimens. Obviously if you're an animal lover this might be a difficult read; at times some of the more graphic descriptions made my own cast-iron stomach churn. Also, if you want to keep intact any unwavering hero-worship for Theodore Roosevelt, this is probably going to kick some holes in it, so you should pass. But if you want to get a better handle on the president who created five of our most important national parks, advanced our understanding of innumerable animal species, and used federal law to create and protect hundreds of wildlife habitats, this is definitely the book for you.